Mayor Bill de Blasio has signed legislation to lower New York City’s default speed limit from 30 miles per hour to 25. 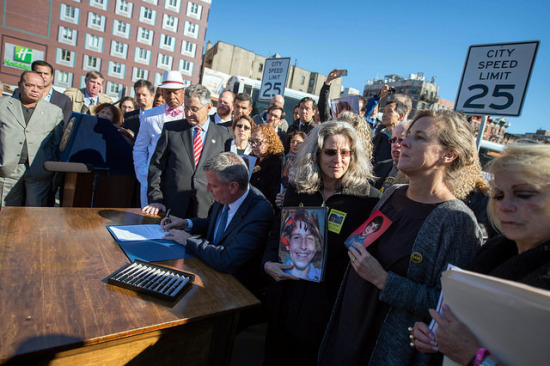 The measure was recently passed by the City Council and is one of the central policy pieces of Vision Zero—the mayor's plan to eliminate traffic fatalities in the city. “We’re here today to make good on a commitment to save lives in this city,” the mayor said at the top of the press conference, which was held on the Lower East Side near where 12-year-old Dashane Santana was struck and killed by a car in 2012. Dashane's grandmother, as well as other families who have lost loved ones in traffic accidents, stood behind the mayor as he put pen to paper. According to the mayor’s office, come November 7th, about 90 percent of the city’s streets will have a speed limit of 25 miles per hour or lower. To inform drivers of these changes, the NYC DOT has launched a public awareness campaign and will be installing 3,000 new speed limit signs over the next year. The five mile per hour change may seem minor, but an individual hit by a car traveling 30 miles per hour is twice as likely to die than from one traveling 25. Citing numbers from "last year" (which actually appear to be from fiscal year 2011–2012) Mayor de Blasio noted that 291 people were killed in traffic accidents in New York City. "That's almost as many people lost to traffic fatalities that were lost to murder," he said. Of those killed in traffic accidents, 115 were drivers and 176 were cyclists or pedestrians. In 2013, according to city data, 286 people died in traffic accidents in New York, but according to the New York State DMV, that number is actually higher, 294. "Part of the discrepancy may come from the fact that often people who sustain life threatening or critical injuries may not die for many months after being hit," said Alana Miller, Transportation Alternative's policy coordinator, in an email. The NYC DOT did not respond to AN's request for more information on the numbers mentioned by Mayor de Blasio. These recent figures, though, follow about 10 years of dropping traffic fatalities. "The significant decline in traffic deaths over the last decade is not an accident," said Miller. "It is the result of smart traffic safety policies that have redesigned dangerous streets, installed protected bike lanes, widened sidewalks and put in pedestrian islands, created safer speed limits around schools and slow zones where communities have identified speeding problems, and installed cameras to deter driving behavior." Now, thanks to early Vision Zero interventions, Mayor de Blasio said the rate is once again decreasing. "As of last Thursday, citywide pedestrian fatalities were down over 20 percent from the same point last year," he said. "Overall traffic-related fatalities were down nearly seven percent. Vision Zero has just begun, but look at that progress." At this point, it's hard to say if that reduction is from Vision Zero, or if the numbers are reverting to the early-2000's trends. Despite this year's reduction in traffic fatalities, the numbers are still quite grim—especially for cyclists. According to data compiled by WNYC, as of mid-October, 200 people have been killed in traffic accidents this calendar year. The rate is down slightly from last year, but WNYC noted that 17 cyclists have been killed since January 1st, which is more than twice as many were killed last year. Improvements at the intersection of Duncan and Valencia. Consistently ranked as one of the most bike friendly cities in the United States, San Francisco—where over 3 percent of the population commutes by bicycle—has its sights aimed high. The long-term bicycle plan put into effect five years ago—officially dubbed the 2009 San Francisco Bicycle Plan––has lofty aims to increase bike ridership to 20 percent by 2020 through a series of projects. As of this year, 87 percent of the projects, or 52 out of the 60 projects in the 2009 plan, are complete. This past year the Bay Area Bike Share opened, and other initiatives will soon see the light of day. A long-term goal includes adding over 30 miles of bike lanes to the more than 45 miles that currently exist in the city. Officials want to make cycling safer and more appealing to everyone. “We are focusing on better connecting the bike network. We don’t want a fragmented approach,” said San Francisco Municipal Transportation Agency (SFMTA) spokesperson, Ben Jose. Opened last year, the Bay Area Bike Share (BABS) now has 3,000 annual members and 28,000 casual riders (those with one or three day passes). There are 350 bikes and 35 stations in San Francisco, with another 400 bikes and 35 stations in nearby cities including Palo Alto, San Jose, Mountain View, and Redwood City. The bikes and stations are operated by Alta Bicycle Share, and received $11 million in public funding. Plans to expand are being put on hold. When the bike-share opened, the original plan was to push out 1,000 bikes across the bay and 50 stations in San Francisco within the first year. But completing this phase—distributing an additional 300 more bikes to the five Bay Area cities and 15 more stations in San Francisco—could take up to two more years. Alta Bicycle Share is changing ownership, and the companies providing the hardware and software for the bikes have filed for bankruptcy. The city wants to add 3,000 more bikes, but this would depend on securing an additional $25 million through sponsorships. In an area that has become filled with coffee shops, cafes, and parklets, a portion of Valencia Street will get the first raised bikeway in the city (pictured, left). 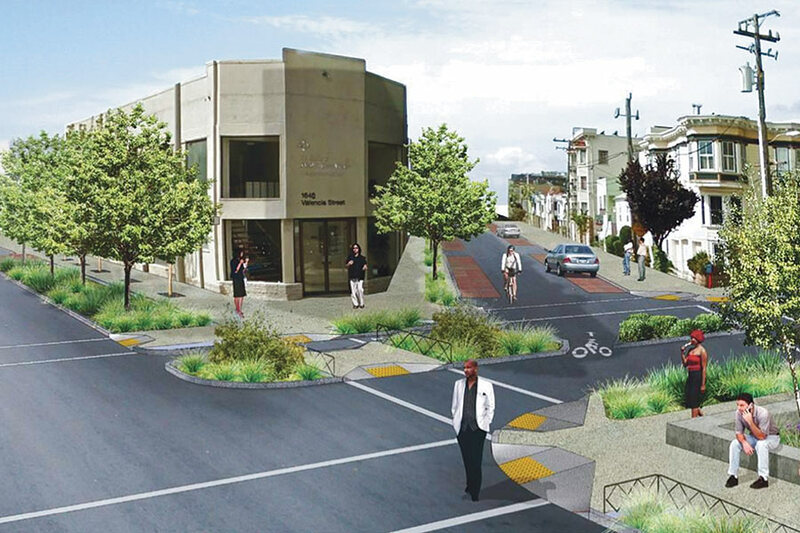 In an effort to improve north/south access, it will upgrade the southbound existing bike lane on a portion of Valencia Street, between Duncan and Caesar Chavez streets. The bikeway will lie in between the pedestrian sidewalk and the road. This effort is part of the Green Infrastructures and the Mission & Valencia Gateway Projects, helmed by the San Francisco Municipal Transportation Agency and the San Francisco Public Utility Commission. Along with the new bikeway, the project will also widen sidewalks, build two greened plazas, and install permeable pavement and rain gardens to help capture stormwater. Construction is expected to be complete by mid 2016. Other raised bikeways planned in the city are on 2nd Street and Masonic Avenue. Each will add a fourth type of major bike infrastructure to the city that currently offers off-street bike paths, protected bike lanes that run along the roadway, and shared bike and automobile routes. 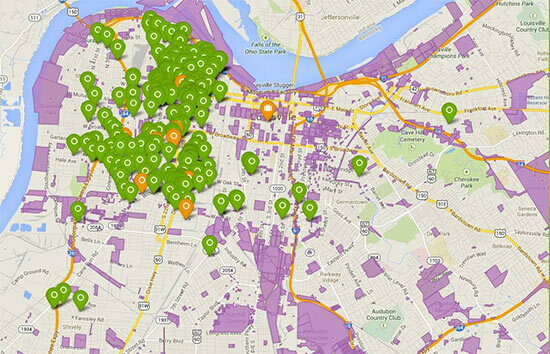 Another planned Green Infrastructure Initiative is the Wiggle Neighborhood Green Corridor. SFMTA and San Francisco’s Public Utilities Commission (SFPUC) are partnering on this project. The much beloved Wiggle is a zig-zagged flat route (formerly a toll road) that stretches from Market Street to Golden Gate Park, enabling cyclists and pedestrians to circumvent the city’s hills. Bikers have been using the path for years, but new green sharrows were added in 2012 to make it easier for riders to see the route. The Wiggle initiative is also focusing on improving stormwater management by bringing in new, permeable pavement. Traffic calming measures are also in the works, including a traffic diverter at Scott and Fell streets and a raised intersection at Page and Scott streets. Improvements are being funded by the Sewer System Improvement Program and the 2011 Road Repaving and Street Safety Bond. They will cost SFMTA approximately $1.4 million. SFMTA is focusing on making several districts safer and facilitating greater movement in the city. 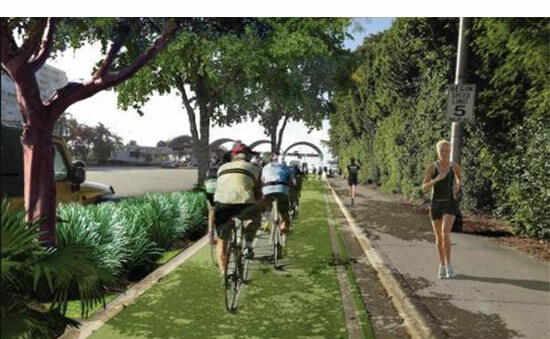 One project, the Polk Streetscape Project, which will include enhancements like green bike lanes, protected bike lanes, and bulb-outs, is undergoing Environmental Review and will be up for approval by the beginning of next year. SFMTA is also looking at collisions, and have designated areas in the city as Cyclist High Entry Corridors (CHEC). Two of these areas are South of Market and the Embarcadero Waterfront. Another focus is Howard Street in South of Market, which serves as an east-west connector. SFMTA wants to better organize the roadway so people are safer and better oriented. They will narrow existing lanes and install buffered painted bike lanes—a short-term improvement to increase visibility. This would be the first of 24 projects as part of Vision 0—an initiative to bring traffic fatalities in the city down to 0 by 2024. SFMTA officials are also developing a concrete design for the Embarcadero Waterfront––a 3-mile-long, mixed-use promenade—and hope to have concepts ready by the fall of 2015. In early September, New York City Transportation Commissioner Polly Trottenberg hopped on a Citi Bike and pedaled up Manhattan’s newest protected bike lane. She was headed to a press conference where Bicycling Magazine would announce that the country’s biggest city was also its most bike-friendly. In just one year, New York had jumped from seventh place to first—topping the likes of Portland, Minneapolis, and Boulder. Trottenberg touted New York’s bike culture, but acknowledged that the city’s top billing was not necessarily her doing. After all, she had only been commissioner for nine months. The credit, she explained, went to her predecessor, Janette Sadik-Khan, the firebrand commissioner who fundamentally transformed New York City’s streets under Mayor Bloomberg. At the announcement, Trottenberg promised that the new administration would build on that impressive legacy. During Bloomberg’s tenure, over 350 miles of bike lanes were created (about 30 of which were protected), 16,000 bike racks were installed, and Citi Bike was launched. According to a new Department of Transportation (DOT) report, these investments paid huge dividends: As significantly more cyclists appeared on city streets from 2001 to 2013 the risk of them getting seriously injured dropped 74 percent. The city routinely studies safety and traffic patterns. During these years, the politics of bike lanes shifted dramatically as well. There is perhaps nobody who personifies that change more than Bill de Blasio. The politician who once called Sadik-Khan a “radical” and labeled himself an “incrementalist” on bike lanes, is now trying to double the amount New Yorkers bike by 2020. De Blasio likely knows that if he is serious about hitting that ambitious goal, he will not be able to do things incrementally. While the mayor and his DOT have not offered many specifics about where and when bike lanes will be installed, de Blasio has pledged to add more bike lanes and expand Citi Bike into the outer boroughs. But before the popular, yet financially strained, bikeshare program can be completed it has to be bailed-out. Now, after months of negotiations, it is widely expected that Related Companies will do just that. If a deal is finalized, more blue bikes should appear on the road next year. Despite the mayor’s promise to make the city better for cyclists, he has been met with skepticism, and often criticism, from some bike advocates. They say the NYPD is too aggressively ticketing cyclists, too often parking in bike lanes, and that bike safety is not featured prominently enough in Vision Zero—the administration’s initiative to reduce, or eliminate, pedestrian fatalities. Paul Steely White, the executive director of Transportation Alternatives, disagrees. He said that the administration’s focus on street safety will improve conditions for everyone, including cyclists. “In establishing Vision Zero as the new framework for New York City transportation policy, the administration set the stage for a significant gain with the bike network,” he said. Looking forward, Steely White hopes the administration will make a strong push for bike lanes, especially on major arterial roads, but in the meantime, he explained, lowering the city’s default speed limit makes a big difference for anybody crisscrossing the city by bike. 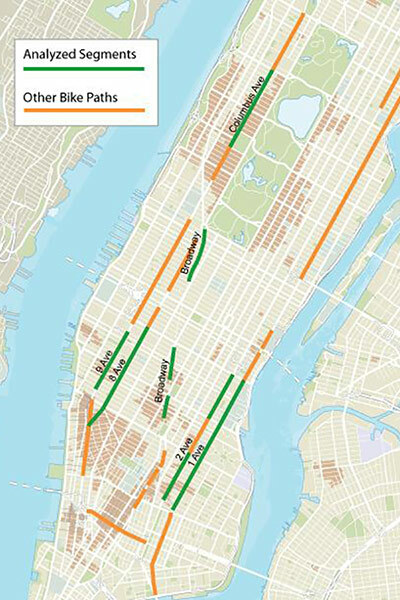 As the final bike lanes planned under Mayor Bloomberg appear on city streets, there is reason for cyclists to be optimistic about what’s next for New York’s bike infrastructure. If Citi Bikes start appearing in more neighborhoods, there will likely be enough public, and political pressure, to ensure that bike lanes start forming around them. 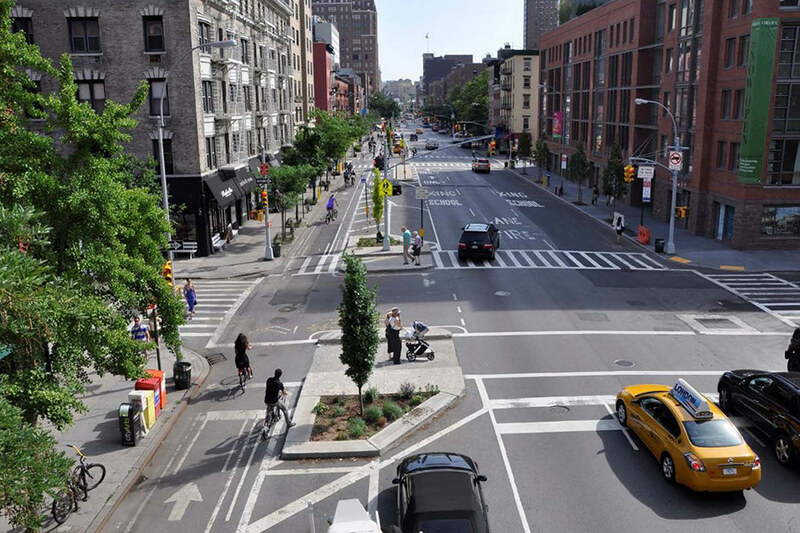 In Manhattan, the Trottenberg-led DOT could continue the island’s impressive transformation into a bike-friendly hub by approving plans for a pair of bike lanes that cut through the heart of Midtown—one going up 6th Avenue and the other down 5th Avenue. A decade ago, that type of proposal would have been unthinkable, but things have changed dramatically since then. And soon enough cyclists will know if Mayor de Blasio really has too. Bridges. They can be grand and majestic, awe-inspiring symbols of engineering ingenuity, city-defining pieces of infrastructure, and, as you may have heard by now, at serious risk of collapsing. To stop that from happening, engineers basically have two options: repair or replace. Both of those strategies are currently pursued in the New York City region. 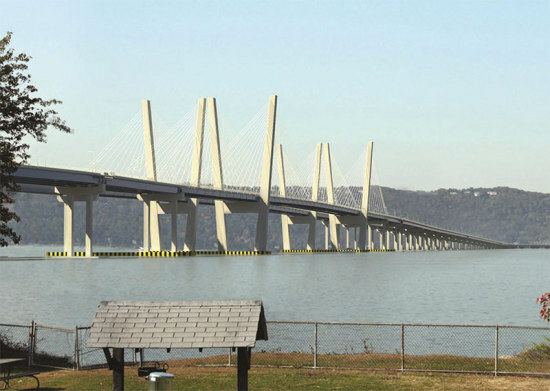 As the New York Times explains in a new video, the Tappan Zee Bridge was in such bad shape that it made more sense to just build a new bridge right next to it at the cost $3.9 billion. When complete, the new structure will have express bus lanes, and a bike and pedestrian pathway. Now, obviously, the Brooklyn Bridge isn't going anywhere, but the aging icon does need to have some work done. Instead of replacing the structure, the bridge has remained open while construction crews have been reconstructing its ramps and approaches, replacing 600 bridge bearings, and removing lead paint. In the age of apps, we have seen basic human activities like eating, dating, shopping, and exercising be condensed into simple swipes and clicks. It’s a brave new world and one that has folded-in the complex process of financing, developing, and designing new projects. And in recent years, there has been a batch of new apps designed to help planners, architects, cities, and the general public create more livable cities. Here are a few of those apps that caught AN’s attention. StreetMix Imagine if you could redesign a city street in an instant—without the hassles of political approval, community input, or extensive planning. Sounds pretty nice, right? Well, an app called Streetmix lets you live that urbanist dream, at least in a two-dimensional, cartoony kind of way. In the Streetmix world, if you want a wider bike lane, you can go right ahead and build a wider bike lane. You want light-rail? All aboard. You want a wayfinding sign? Done. How about two wayfinding signs? They’re already in. It’s just that easy. Now, obviously, the app is not intended to be an actual data-driven planning tool. For starters, there are no implications if you, say, remove all driving lanes and mass transit options and replace them with trees and benches. And that’s the fun of it. Instead, Streetmix was designed as a user-friendly program that lets everyday citizens understand what's possible on a typical city street. Lou Huang, of Code For America, which is behind the app, told Next City that he hopes these people can then use this knowledge to better engage in their community's planning process. WideNoise and Stereopublic A neighborhood's lively mix of restaurants, bars, streets, and shops can be both its biggest draw and its most frustrating feature. All of that street-level action may signify a vibrant and livable slice of the city, but try living directly above it. Try getting some sleep with all of that constant chaos. For those who have to wear earplugs, and sleep alongside a white noise machine, there are two apps that may be able to help you out. The first is called WideNoise and it allows users to track noise pollution across an entire city. It’s part of a larger, open-source EU project called EveryAware which monitors all types of pollution. WideNoise is focused entirely on the noise side of things. “With WideNoise you can monitor the noise levels around you, everywhere you go,” explained the app's creators on its website. “You can also check the online map to see the average sound level of the area around you. Do you live in a ‘sleeping cat area’ or in a noisier ‘rock concert area’?” So WideNoise might not be a huge help to those currently living in a noisy area, but it could be a helpful tool when they try to escape it. A somewhat similar crowd-sourcing, noise-tracking app is the less-official-sounding Stereopublic. The app's creators describe it as "a participatory art project that asks you to navigate your city for quiet spaces, share them with your social networks, take audio and visual snapshots, experience audio tours and request original compositions made using your recordings.” OppSites and OpportunitySpaces Officially launching this fall is OppSites, an app that connects cities that want to develop with national investors who can make it happen. To do that, the platform allows cities to “promote their development priorities and share local knowledge” with interested investors. There is a free service that offers investors real-time market and civic updates on certain sites, but those willing to shell out a few dollars can get the premium level that provides visualizations of development opportunities. There is also a similar website with a similar name, OpportunitySpace, that offers a similar service: portals that visualize under-used or vacant sites that are all publicly-owned. The idea is roughly the same—connect developers, investors, and the public with information about cities, but the website is focused entirely on government properties that have seen better days. In June, the site’s cofounder and CEO, Alex Kapur, told CityLab that all the information they display is publicly available, it's just not publicly accessible. Pursued by both San Francisco and Los Angeles, George Lucas ultimately chose Chicago for his Museum of Narrative Art, an archive for the Hollywood icon’s extensive collection of movie memorabilia and modern art. Mayor Rahm Emanuel celebrated the announcement, calling it a “cultural and job creation asset.” The museum is part of Emanuel’s agenda to promote cultural tourism downtown. After a nonprofit in San Francisco rejected Lucas’ original proposal to build near the Golden Gate Bridge, Los Angeles, and Chicago—home to Lucas’ wife, Melody Hobson—moved quickly to woo the Star Wars creator into building elsewhere. Some local observers recommended the former Michael Reese Hospital site—a vacant lakefront expanse in Bronzeville that has also been suggested for a casino and Barack Obama’s presidential library. The task force said infrastructure improvements to the site would require too much public money. They also cut sites in the Calumet Region on the city’s southeast side, near O’Hare International Airport, and near the Pullman neighborhood in favor of a more centrally located site. Chicago’s Lakefront Protection Ordinance, passed in 1973, bars private development east of Lake Shore Drive. The group Friends of the Parks said allowing Lucas to build his museum on the Museum Campus between Lake Shore Drive and Burnham Harbor would encourage lakefront development. The city’s Plan Commission and City Council still need to approve the site, but Emanuel has said the development is on solid legal ground. He said the museum, built with private money, would legally be a public development as part of the city’s Museum Campus. Its construction is expected to move all existing parking on the site underground, resulting in a net positive number of parking spaces. 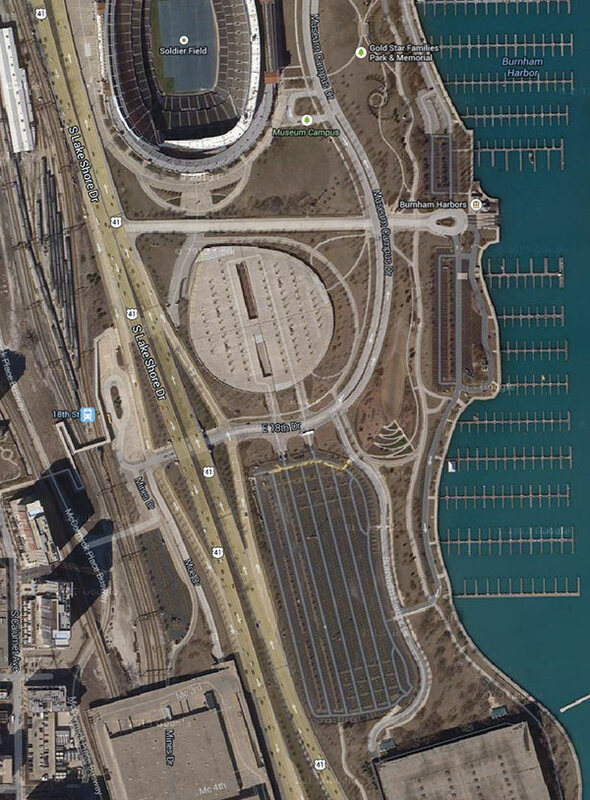 “[T]he South Parking Lots site provides a unique opportunity to reclaim hardscape and turn it into green space along our lakefront,” reads the city’s task force report. In addition to building new park space on site, the report recommends tying programming into nearby Northerly Island, which is currently undergoing a redesign led by Studio Gang. The report also suggested transit upgrades, including new bike lanes and/or a special bus route, updating the 18th Street Metra stop and reconfiguring McCormick Place for CTA buses. 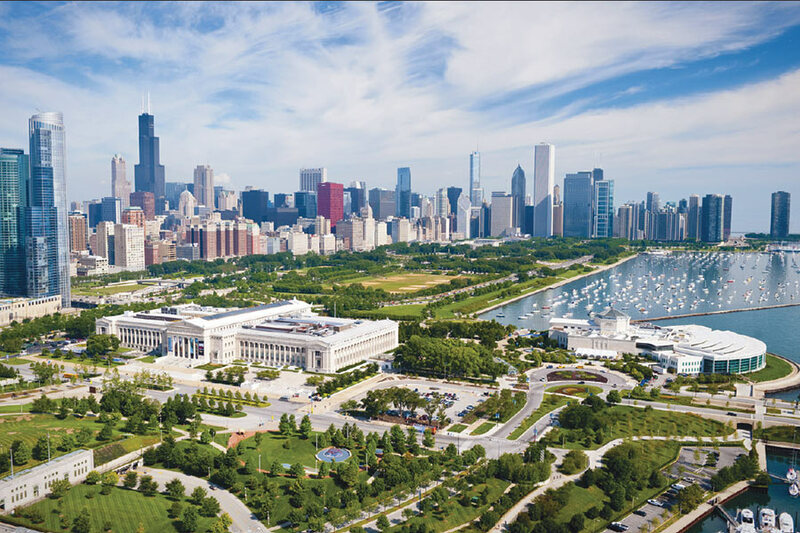 But Friends of the Parks said proponents of building the Lucas Museum on the lakefront are underestimating the cost of development and could be setting the city up for a bait and switch. Alderman Bob Fioretti, a likely mayoral candidate, has said he would support a legal challenge to the museum. Emanuel has not budged on the recommendation made by his task force, citing figures of economic development in excess of $2 billion. “The Task Force strongly believes that the Museum should be a gift for the entire city—not just for one neighborhood or region,” reads the report. At press time a design team, including Beijing-based MAD Architects and Chicago-based VOA Associates, was announced for the museum, which is expected to open in 2018. Studio Gang, working with SCAPE, will design the landscape, as well as a new pedestrian bridge to Northerly Island. 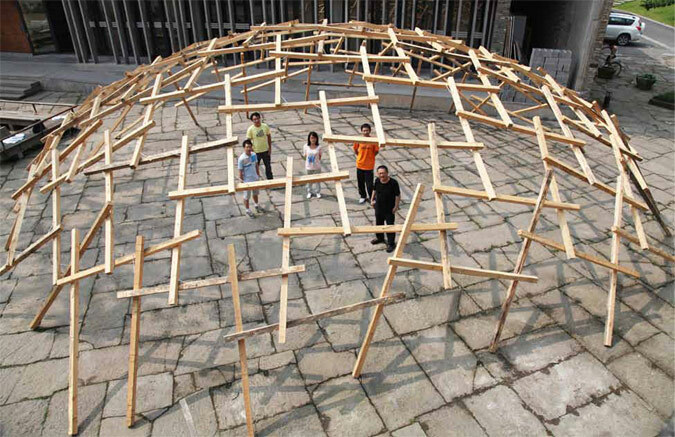 Decay of the Dome exhibit at the 2010 Venice Biennale. News broke in late June that Chicago plans to kick off a new tradition in 2015. Every two years the city will host North America’s biggest exposition of international and contemporary architecture—its own biennial, taking after the famous gathering in Venice that has inspired global design pilgrimages since 1980. 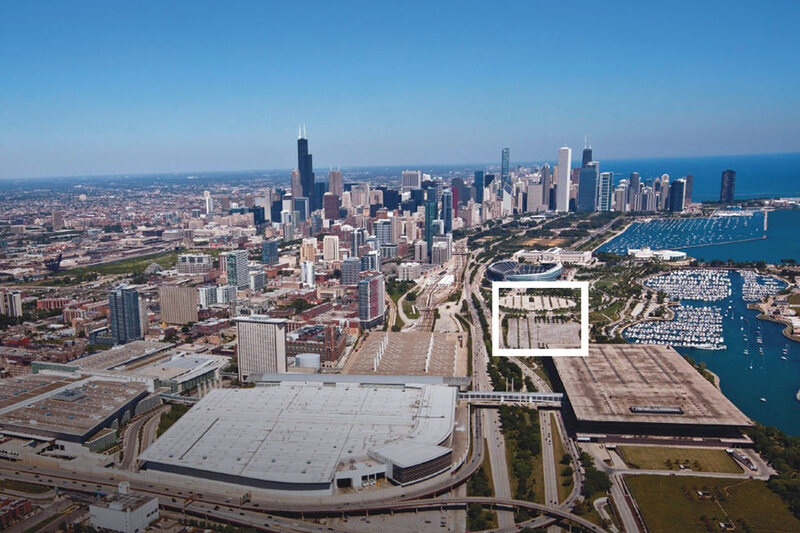 The goal of the event is to renew Chicago’s vaunted place among the international design community, and to nab tourism dollars for economic development. It’s a bombastic proposal, perfectly in line with Mayor Rahm Emanuel’s promotion of cultural tourism. And why not? Chicago’s history as a center for modern architecture is evident to anyone who has strolled The Loop or surveyed contemporary design history. Two of the stars on our municipal flag are for expos (the World’s Columbian Exposition in 1893 and the Century of Progress Exposition in 1933–34), so maybe it’s in our DNA to seek out the world stage through such shows. Ironically there’s a certain parochialism that comes with Chicago’s desire to host an international design expo. Implicit in the announcement is a bit of boosterism—as much as the aim of the event is purportedly to survey contemporary design from around the world, it wouldn’t merit mayoral fanfare without the requisite language about Chicago’s integral place in shaping the discipline throughout the 20th century, and its “world-class” scene today. It’s the Second City complex: we want the cultural influence enjoyed by New York and L.A. So let’s celebrate our industrial heritage—trains, stockyards, manufacturing—Nelson Algren, Studs Terkel, Adler & Sullivan, Holabird & Root, and so on. Sure, show off the reborn riverfront to signal the return of urban waterways thanks to environmental protections and investments in public space. 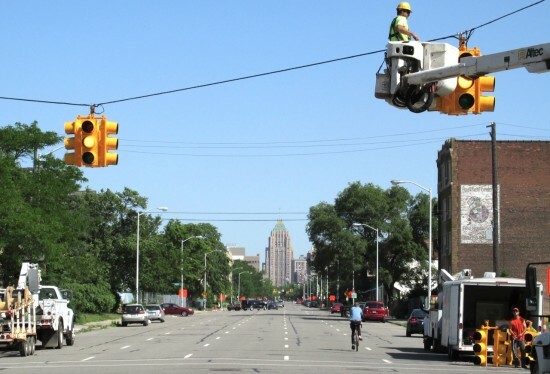 Hold up resurgent downtown real estate, bike lanes, and high-tech jobs bringing young people back to cities that used to make up the Rust Belt. But if this exhibition is more than a tourist brochure, it should delve into our challenges as well as our victories. Let’s see exhibitions on poverty, crime, and segregation. Show off gun violence, class divides, and the concentration of wealth and political power among a proportionally smaller group of individuals than at any time since the Gilded Age. Hold up our nation’s struggles with its successes, and then we’ll have a show that people will travel far and wide to see. After all, it has been said that Chicago is the most American of American cities. These are American problems, and they deserve solutions. It’s the first American biennial; what’s more American than public debate? This is a perfect time and place to put big questions to our designers, artists, and architects, pressing them to start a conversation that will go beyond the expo pamphlets and cocktail parties. In the decade since it was rezoned, Downtown Brooklyn has grown up in a big way. Just look at its skyline and the new apartment towers and hotels that call it home. The open air between those buildings will soon be filled because development isn't slowing down—it's just getting started. 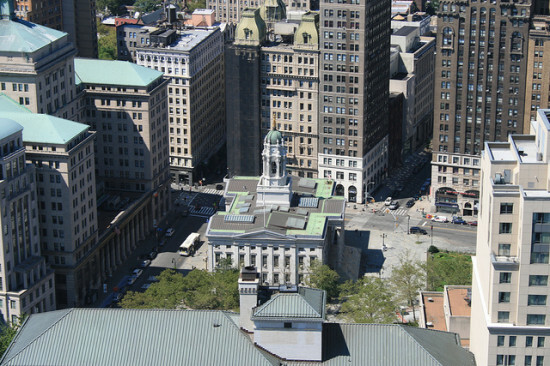 But the next decade of change in Downtown Brooklyn could offer much more than the first. That's because as new buildings rose, the area’s street-level never kept pace: public space is still scarce and underused, streets are hard to navigate and dangerous, and educational and cultural institutions have been disconnected. Today, however, Mayor de Blasio announced strategies to change all that by injecting the booming district with new (or refurbished) parks, redesigned streetscapes, new retail, and better connections between its many cultural and educational institutions. These investments could be transformative in their own right, but are especially notable given Mayor de Blasio’s hesitancy to talk about the importance of urban design. 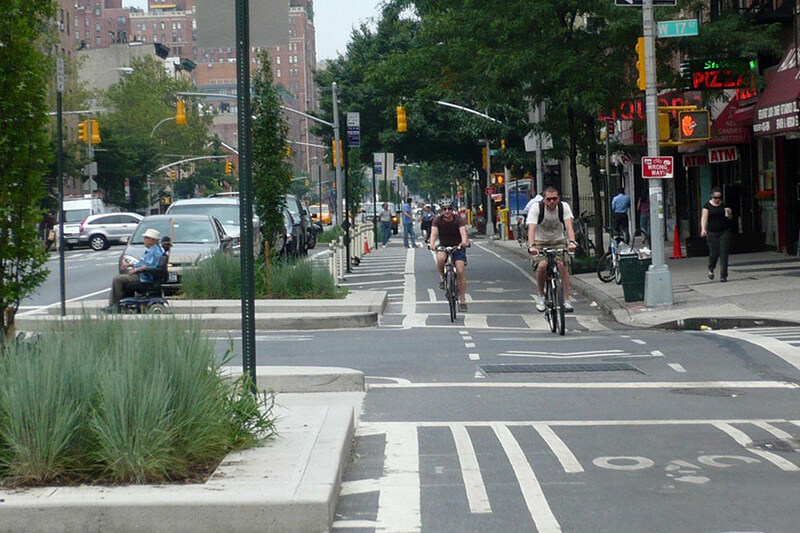 To be clear, New York City’s commitment to safe, livable streets did not die when Mayor Bloomberg walked out the door. In de Blasio's New York, there have been new bike lanes and the like, but the mayor doesn't speak about these issues with the force of his predecessor. That seemed to change today as this plan goes all in on urbanism. “This is one of the city’s great success stories, and we have an incredible opportunity to take these stunning communities, parks, and institutions and knit them together,” Mayor de Blasio said in a statement. “The investments we are making will help Downtown Brooklyn continue its rise, generate good jobs, and make this a more dynamic neighborhood to live and work.” The plan starts where Downtown Brooklyn starts—at the mouth of the Brooklyn Bridge. The City plans to transform the 21-acre patchwork of underused parks and public plazas between the bridge and Borough Hall into a “great promenade and gateway into Brooklyn.” The renovated space, known as the "Brooklyn Strand," will be designed to better connect with the area's transit hubs and the celebrated Brooklyn Bridge Park, designed by Michael Van Valkenburgh Associates. This strategy follows a study commissioned by the Brooklyn Tech Triangle - a cluster of tech companies in Downtown Brooklyn, the Brooklyn Navy Yard, and DUMBO. It was led by WXY. While not mentioned explicitly, Vision Zero factors into this plan though the City's strategies to make certain corridors more bike and pedestrian friendly. This includes a multi-million dollar transformation of the Brooklyn side of the Brooklyn Bridge—a plan that was conceived under Bloomberg and is slated to break ground next year. Over on Willoughby Street, the City will "explore non-traditional roadway design that recognizes and accommodates the heavy use of the area by pedestrians." ARUP is working with the city on that redesign. The City has also pledged to build a new one-acre public park in Downtown Brooklyn and refurbish two others—Fox Square and BAM Park. The latter has been closed to the public for decades, but will be spruced up by WXY. Fox Square will be renewed by AKRF, with Mathews Nielsen. To boost business in Downtown Brooklyn, the City will offer-up some of its own ground-floor space to retail tenants. It may also consolidate its 1.4 million square feet to provide affordable office space for businesses. And there are plans to launch a consortium between Downtown Brooklyn’s 11 colleges to “better connect the tech, creative, and academic communities.” This is intended to best prepare students for jobs at Brooklyn’s Tech Triangle. The Economic Development Corporation will provide $200,000 in seed funding to kickstart that initiative. As part of this plan, the emerging Brooklyn Cultural District, which straddles the blurry border between Downtown Brooklyn and Fort Greene, could get its very own Businesses Improvement District (BID). The City said it will work with the over 60 cultural groups in the district to market the area as a preeminent cultural hub. Of course, at this point, these are all fairly vague proposals—just ideas on paper unbound by hard deadlines. But this announcement shows that as Downtown Brooklyn builds toward the sky, the City will refocus on the people walking, biking, studying, and working on the streets below. [beforeafter] [/beforeafter] From the West Coast of Portland, OR to the East Coast of New York City, designated cyclist and pedestrian lanes called cycle tracks are realigning pavement away from motor vehicles and creating safe infrastructure for bikes. Architect and avid cyclist Bernard Zyscovich has proposed such an infrastructure upgrade in Miami-Dade, Florida that would convert a killer expressway into a cycle super highway. 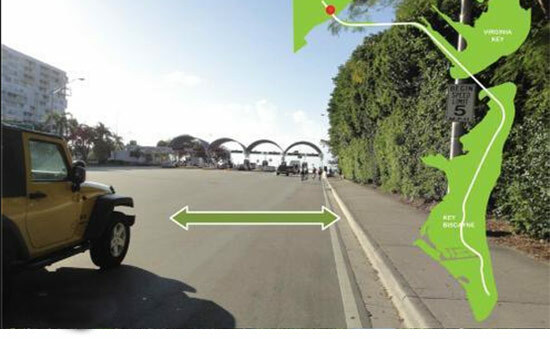 Rickenbacker Causeway—linking Miami to Key Biscayne—currently holds three car lanes in each direction, but Zyscovich's plan would convert the divided highway to two lanes for automobile traffic and a landscape-buffered lane for cyclists and pedestrians. Hardwood trees and bushes that would be planted along the cycle track would increase safety by separating the various modes of transportation. Zyscovich suggested a preliminary project using plastic poles to separate the lanes, which mimics a plan implemented on I-95. The full project proposal would cost approximately $20 to $30 million along the entire stretch of Rickenbacker Causeway, however, there is currently no official backing for the project. Separating automobiles from other modes of vulnerable transportation has gained grassroots support in Florida. According to the Florida Department of Highway Safety and Motor Vehicles, Florida has a record of having the highest number of fatal bicycle crashes of any state. Further, Miami Dade County has one of the highest numbers of bicycle fatalities, which was highlighted by national news when the 44-year-old cyclist Aaron Cohen was struck and killed by a motorist. While Los Angeles implements plans for new bike lanes and other pedestrian improvements along its streets, there is still plenty of work to do. 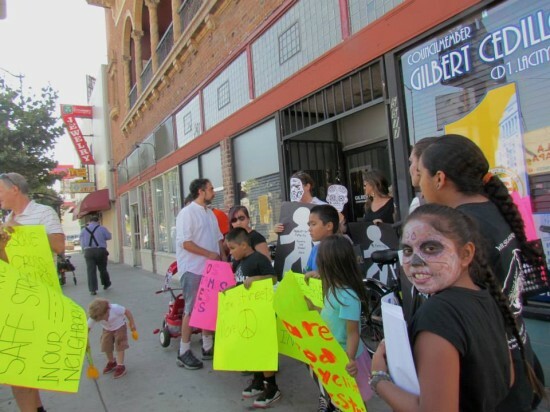 As part of that struggle, Highland Park residents and local activists this week staged the "Walk For The Dead," along North Figueroa Street, wearing Day of the Dead makeup and costumes as a reminder of the pedestrians and bikers who have been killed by cars on the thoroughfare. The road is often used as an alternate route to the nearby 110 Freeway, with cars traveling at excessive speeds, claimed the protesters. They also noted that while LA has chosen the road to become one of the its "Great Streets," local councilman Gilbert Cedillo has resisted efforts to make Figueroa a "Safe and Complete Street," with bike lanes and other traffic calming measures. "The community is sick of unsafe streets, and wants to see improvements," said Eric Bruins, Planning and Policy Director for the Los Angeles County Bike Coalition. Bruins said that plans for bike lanes on the street have already been approved by the city's Department of Transportation (as part of the 2011 city bike plan), but that the department is still awaiting Cedillo's sign off. AN's request for comment from councilman Cedillo's office has so far gone unreturned. The Bike Coalition hopes that bike lanes are the first phase of improvements on the street, added Bruins. Future measures, dependent on funding, would include plantings, street furniture, improved crosswalks, and other pedestrian improvements. But for now safety is the chief concern. "Our children deserve safe streets," said local community leader Monica Alcaraz. "North Figueroa is not a Freeway." For many, architecture isn't the first thing that comes to mind when considering Nashville—it's called the Music City for a reason. But there is more to Nashville than country songs, barbecue ribs, and the eponymous show on ABC. In recent years, the city of 600,000 has become a regional leader in smart urban design and distinctive architecture. New riverfront parks are transforming Nashville's connection to the Cumberland River, bikeshare docks have appeared around downtown, bus rapid transit is in the works, and the city's tallest tower is set to rise. And that's just the start of it. Take a look at the city's dramatic transformation and a peek at where it's headed. Music City Center One of the most significant new works in Nashville is Music City Center—a 2.1-million-square-foot convention center, which the mayor’s office called “Nashville’s beacon of momentum.” The center is the work of tvsdesign, Moody Nolan, and Tuck Hilton Architects, and is as sprawling as it is striking. The structure is covered with an undulating roof that is meant to evoke the rolling hills of Tennessee. Below that curvy topper is a primarily glass facade and prominent, idiosyncratic, paneled forms that pull the building out of its own skin. The $585 million convention center also includes a public art collection and a 6,000-seat ballroom. “The defining character of Music City Center is how design—from large scale moves to the smallest detail—can tame an immense structure,” said tvsdesign in a statement. “The building communicates warmth, intimacy and an attention to detail that belies its 2 million square feet and reflects the distinct character of Nashville and Middle Tennessee.” Nashville Convention Center Redevelopment With the shiny new Music City Center open, Nashville’s existing convention center is no longer needed, so out with the old and in with the new. The city has proposed replacing the existing structure with a one-million-square-foot, mixed-use development. By the numbers, the project includes 840,000 square feet of office space, a 673-room Nashville Renaissance Hotel, 244,000 square feet of retail, and 50,000 square feet for the National Museum of African American Music. Gresham, Smith & Partners is designing the project, but, according to the mayor’s office, its “scope and design elements will be refined in 2014 through community input.” The latest renderings show a multi-story retail base with glass towers above. NACTO Street Design In June, the Tennessee Department of Transportation became the first southern state to endorse the National Association of City Transportation Officials’ “Urban Street Design Guide,” which serves as a blueprint for safe, multi-modal streets. This campaign was launched in October by then–New York City Transportation Commissioner Janette Sadik-Khan who was serving as NACTO’s president at the time. “The Tennessee DOT endorsement of the Urban Street Design Guide is part of an exciting movement among states,” said Linda Bailey, NACTO’s Executive Director, in a statement. “I look forward to continuing to work with Tennessee and other states to build economically vital, safe and inviting streets going forward.” What does this mean for Nashville, specifically? That’s hard to tell right now, but it underscores the state’s commitment to public transit and safe streets in a region known for its car culture. The AMP, Nashville's Proposed BRT In 2016, Nashville could have its very own, world-class bus rapid transit system that cuts through the city's urban core. Plans for the 7.1-mile system, known as the AMP, have been in the works for a few years and initially included dedicated center lanes and medians for quick boarding. As these things go, the project received some strong public backlash and was almost entirely derailed by a conservative state legislature, with a little help from the Koch Brothers. In March, the Tennessean reported that the billionaires' Americans for Prosperity group helped the state Senate pass a bill to block the $174 million project. But the AMP isn't dead just yet. The final design details of the project are currently being hammered out and construction could start as early as next year. While it’s not entirely clear what the AMP will look like, Ed Cole, the executive director of the Transit Alliance of Middle Tennessee, is optimistic about this project and Nashville’s transit future overall. “The principles behind new urbanism are clearly part of our future here,” he said. 505 Church Street Adrian Smith—the man behind such projects as “the tallest building in the world”—has now designed what would be the tallest building in Tennessee. While not Burj Khalifa height, the tower proposed for 505 Church Street, which is designed by Smith’s firm Adrian Smith + Gordon Gill, climbs its way up to 750 feet. Last August, AN reported on Smith and Gill’s plans for the site, which called for a mixed-use tower that gently bends and twists its way to LEED Platinum designation. That scheme has since been scrapped, but Smith and Gill have released an alternate design for a glassy, residential high-rise. Since a portion of the site was sold to the city for a parking garage, the firm created a more slender tower, which has balconies and horizontal louvers etched across its exterior. “The tower’s shape is based on a parallelogram which has been softened at the corners to maximize river views to the South and East,” said Adrian Smith + Gordon Gill in a statement. “The curved corners minimize the tower’s true East and West facades in an effort to reduce harsh East and West solar exposures.” The project’s developer, Tony Giarratana, told AN that the tower should get underway once the garage is completed some time next year. That puts 505 Church's opening somewhere around late 2018 or early 2019. Virgin Hotel While Sir Richard Branson is all about space travel these days, the knighted billionaire isn’t done with earth just yet. 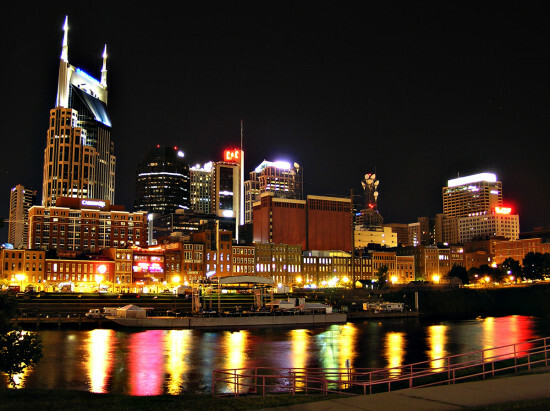 In April, Virgin Hotels announced plans to open its third outpost at One Music Row in Nashville in 2016. There are no renderings for the project just yet, but it is expected to include 240 rooms, a recording studio, and, according to a press release, “multiple concept suites, food and beverage outlets.” In a statement Branson said, “Nashville's time is now, and we want to be part of that excitement. We hope our first venture in Nashville will open the doors for more Virgin opportunities and more global travelers to enjoy Nashville's southern hospitality.” Nashville B-cyle Bikeshare In late 2012, Nashville fell to peer pressure and did what all the top cities are doing these days: It launched a bikeshare program. The 23-station system is known as B-cycle and, according to the program’s website, is an “absolutely stylin’ way to get around town.” Hear that? Absolutely stylin'. Peddle forth Nashvillians, peddle forth. Ryman Lofts In 2013, Nashville opened the colorful Ryman Lofts—the city’s first subsidized housing designed for working artists. According to the mayor’s office “the idea for Ryman Lofts grew from the Music City Music Council, which recognized that making quality affordable urban housing available to emerging artists can spur small business development, reduce transportation demands and help nurture the city’s creative workforce.” The project was designed by Smith Gee Studio, which bookended the primarily, brick-clad structure with bright, colorful panels that frame—and climb on top of—the main facade. Riverfront Amphitheater By this time next year, the good people of Nashville should have another venue to get their country music fix. Construction is currently underway on a 35,000-square-foot amphitheater right alongside the Cumberland River. The structure, and accompanying green space, is designed by Hawkins Partners with Hodgetts + Fung and Smith Gee Studio, and is intended to resemble the Cumberland's limestone cliffs. According to a press release from Mayor Karl Dean's office, "the amphitheater will accommodate up to 6,500 people with semi-fixed seating for 2,200, a 300-person greenway pavilion, and 4,000 lawn seats—all within a natural bowl providing optimal lines of sight to the stage and downtown." The amphitheater anchors the the new 12-acre West Riverfront Park, which replaces the city's old thermal transfer plant. The new space includes, greenways, gardens, a playground, and a dog park.